Today I found out the origin of the Olympic Flame tradition and the Nazi origin of the Olympic Torch Relay. The Olympic Flame tradition has its origins in the Ancient Greek Olympics where a fire was kept burning at an altar dedicated to Hera in a sanctuary in Olympia. Other fires were also lit in Zeus’ and Hera’s temples to honor them during the Olympic Games. The practice was brought back during the 1928 Amsterdam Summer Olympics and today the Olympic flame is first lit at the same location where Hera’s temple used to be before it is transported by various means to the city that is hosting the Games. During the 1928 Amsterdam Olympics, though, there was no torch relay and the fire was simply lit on Marathon Tower at the Olympic Stadium in Amsterdam. The slightly more recent tradition of the running of the Olympic torch to bring the flame to the host city from Greece is not based on any Ancient Greek tradition, contrary to popular belief and Nazi propaganda at the time of the inception of the tradition. Rather, this tradition was brought about during the 1936 Berlin Games. When Hitler came to power in 1933, he was against hosting the Olympic Games. Promoting internationalism and multicultural celebration wasn’t exactly his cup of tea. He also felt the Games were “an invention of Jews and Freemasons” and some thought he’d cancel them being hosted in Berlin (and of course there was much controversy surrounding even holding them there in the first place, given the Nazi party’s viewpoints didn’t exactly hold with Olympic ideals). However, Hitler was convinced by Joseph Goebbels, the Propaganda Minister (yes, they had one), that the Games would actually give the Nazis a great platform to demonstrate Germany’s “superiority” as well as that of their athletes, not just to the world, but to Germany’s own people. As Goebbels said in an interview in 1933, “German sport has only one task: to strengthen the character of the German people, imbuing it with the fighting spirit and steadfast camaraderie necessary in the struggle for its existence.” Six months after taking power, Hitler announced in a meeting that he had decided to allow the Games to be hosted in Berlin. The torch relay was one vehicle of the propaganda machine. The idea was thought up by Carl Diem. Diem was the Secretary General of the Organization Committee of the Berlin Olympic Games, as well as the chief organizer of the 1936 Summer Olympic Games and longtime Berlin sports administrator. Diem was inspired by the torch-like cauldron on Marathon Tower which held the flame at the 1928 games. It isn’t exactly known if he originally came up with the idea to fit with the Nazi propaganda that would be developed around it. Diem wasn’t exactly a lock-step Nazi, even married to a woman from a Jewish family, which for a time got him labeled a “White Jew”. He also lobbied heavily to allow Jews to freely participate in the 1936 Olympics, though it is possible this was just because there was talk of a widespread boycott of the Games if they were not allowed to do so. Diem was later integral in convincing certain key people that German Jewish athletes were and would be treated fairly, which helped put a stop to the potential boycott. They, of course, were not being treated fairly, which Diem well knew. Whatever the case, Hitler and Goebbels loved the idea of a torch relay from Greece, precisely because it would fit so well into the Nazi mystique they hoped to project during the Olympics. They felt it was fitting to show a connection between Ancient Greece and the modern German Reich, with Hitler’s belief being that the Ancient Greeks were Aryan forerunners to the modern German Aryan populace. Further, it would help demonstrate the progression from the great Ancient Greek Empire, to the Romans, to the new empire forming in Germany. For this reason, the propaganda machine put forth that the torch relay was an Ancient Greek tradition during the Games. In any event, after all the preparations were made, including all the torches made by Krupp, a munitions and steel conglomerate that helped arm Germany for the coming war (and during WWI), the Olympic Flame was lit by 15 robed “virgins” under the supervision of a “high priestess” at the recently excavated runes. The flame was lit via a concave mirror reflecting the rays of the Sun, with the Nazi anthem, Die Fahne Hoch, playing in the background. This is pretty much how it is done today, excepting of course without the Nazi anthem. Next, some 3,331 runners carried the flame on various torches about 3,187 km (1980 miles). The trip took 12 full days and 11 nights to get from Olympia, Greece to Berlin, crossing Greece, Bulgaria, Yugoslavia, Hungary, Austria, Czechoslovakia, and, of course, into Germany. As you might expect, there were several protests staged along the way, particularly in Yugoslavia and Czechoslovakia, but security forces were called in to suppress them and let the torch relay continue unhindered. The 2004 Olympics in Athens saw the first ever global relay of the Olympic Flame. All total the relay lasted 78 days covering about 48,000 miles (78,000 KM) and included 11,300 torchbearers. During the 1976 relay, the “flame” was transmitted via satellite with a heat sensor on one end hooked up to a device that transmitted the detection of the flame to a ground station in Canada where a receiver registered the data and then generated a flame via a laser. Not exactly making a flame from the “original” flame in Greece, but it was more meant to celebrate human advancement in technology. During the 2000 Olympics in Australia, the torch relay included a portion where divers carried the flame near the Great Barrier Reef underwater using an underwater flare. Because of frequent protests surrounding the running of the torches, such as those before the recent 2008 Beijing Olympics, starting with the 2014 Winter Olympics, the relay is only allowed to take place beginning with the Greece leg, and then from there must be immediately transported to the country that is hosting the Olympics where the relay will continue without visiting any other country. One of the more unique pranks staged during an Olympic Flame Relay was accomplished by veterinary student Barry Larkin in 1956. Larkin carried a plum pudding can on top of a chair leg. Inside the can was a pair of his underwear, set on fire. He ran well ahead of the real torch bearer and passed the homemade torch to the Mayor of Sydney, Pat Hills, who at first thought it was the real Olympic Flame, as did those in the audience at the time. When the flame has to be transported by airplane, rather than keeping a typical torch lit for the flight, instead a miner’s safety lamp is used. Several of these safety lamps also are kept on hand with a “backup” of the original flame lit in Greece, just in case the torch goes out, which isn’t that uncommon. While the torches going out during the relay is quite common, it’s not so common for the main cauldrons at the stadiums to go out, though it is known to have happened at least once after a rain storm during the 1976 Olympics in Montreal, Canada. Rather than use one of the backup flames, one of the officials re-lit the flame with his cigarette lighter, which was obviously a major faux pas. The error was quickly undone with the flame being intentionally extinguished so it could be re-lit with a backup flame from the original lit in Greece. During the 2008 Olympic torch relay, the torches had to be put out several times due to protestors impeding the running of the relay. This resulted in the torch needing to be transported via bus frequently to get past the protestors, which obviously precluded the ability to leave the torch burning. To get around this sort of thing, and accidental extinguishing of the flame, the current torch design used has two different flames in it, one on the outside, which is meant to be very visible, and one pilot light on the inside, which can be used to re-light the external flame, should it go out. The Olympic torch design varies greatly from Olympics to Olympics; even what fuel is used to keep the flame going was once varied. For instance, in the 1956 Olympics in Melbourne, they used magnesium/aluminum, which created a very bright burning flame, but also had the negative side effect of burning many of those carrying it. Because of the fact that many of the early designs sought look over practicality (often with the designers creating torches that inevitably made sure the people carrying them would come away scorched), since the 1972 Olympic Games in Germany, the standard fuel used has been liquid-based such as propane/butane, which creates a bright flame that also is very practical in that it is easily controlled. 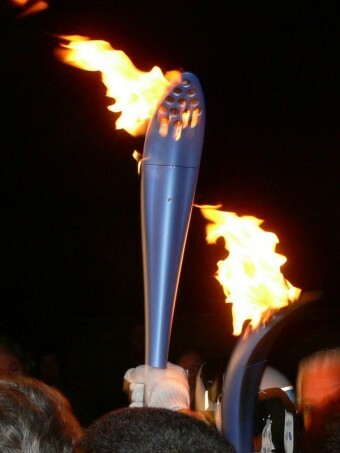 Often several thousand torches are used during the relay, with the flame transferred from torch to torch along the way. For instance, before the 2012 London Games about 8,000 torches were produced for the relay. As mentioned, the Olympics were supposed to be held in Berlin in 1916, but were canceled due to WWI. Germany was then excluded from both the 1920 and 1924 games and only allowed to compete again during the 1928 games thanks partially to lobbying by Carl Diem and his partner Theodor Lewald, who would within a decade be removed from his position in Germany because his father was of Jewish ancestry, though had converted to Protestant. Nevertheless, he was pressured to resign his position, publicly citing his age as the reason. The little girl who presented Hitler with a bouquet of flowers as Hitler took his seat at the opening of the 1936 Games was none other than Carl Diem’s five year old daughter, Gudrun. Diem’s next major event he’d help put together at the Olympic stadium in Berlin happened almost a decade after the Games. In March of 1945, Diem gave a speech to thousands of teenagers exhorting them to defend Berlin from the Red Army with their lives, as the ancient Spartans did against Xerxes’ mighty army. Over two thousand of those teenagers would be dead within two months trying to defend Berlin. Despite his connections with the Nazi Party, Carl Diem is today considered one of the greatest sports historian and sports educators of the 20th century.